As many of you know, I have launched a project to collect an extensive database of statistics for each player in the Scottish Premiership. All of the date is collected here. I think it is safe to say that you will not find this kind of detailed stats anywhere else for the SPFL…or too many other leagues. In this post, I’ll highlight a handful of stats & present them with a focus on the output of each Rangers player & then give you a sense of how their top players stack up in relation to the rest of the league. The first set of data will be a statistical rating that is unique to the site called Offensive Statistical Contribution Rating (OSCR). This is an attempt to create a single number that rates a player’s offensive impact on his team’s chances of winning matches. Normally this stat should be isolated to single matches but as the season goes on a per 90 minute average will be a nice barometer of a player’s value to his team. For a more detailed breakdown of how this rating is determined take a gander over here. Kenny Miller has been the whipping boy this week & even though he has missed some clear cut scoring chances this season….he’s also been the team’s best attacking player. He is averaging 1.75 shots per 90 minutes (second to Windass’ 3.09), unfortunately only 20% of his shots have been on target. That will change if he continues getting into quality shooting areas. He has a team high four Scoring Chances (Windass & Morelos have two each) & that has translated to a team high 1.07 Expected Goals. Obviously he has zero league goals after three matches, but again…that will likely change soon. Miller is turning 38 years old at the end of 2017. He is reaching the end of his career…however, given that he is still getting quality opportunities to score & given his recent output…I’d say ease up on the guy. If he matches his production of recent seasons, he’ll be good for another 10 goals or so. The problem becomes that nobody else is stepping up & getting the kinds of chances that Miller has gotten. Part of the frustration from many supporters is Miller’s habit to drop back into play, searching for ways to get more time on the ball. Sometimes it’s prescribed & sometimes it’s Miller’s own doing. What critics overlook is the fact that he is one of only three players this season to get an assist on a goal & one of two to get the secondary assist on a goal. Again, this speaks to other issues that Rangers have when it comes to a) relying too much on crosses & b) not having someone from midfield making incisive passes into the box from central areas. Miller is second on the team with five Key Passes (the pass that sets up a shot) & tied for second with three Secondary Shot Assists (the pass to the player who makes the Key Pass to set up a shot). 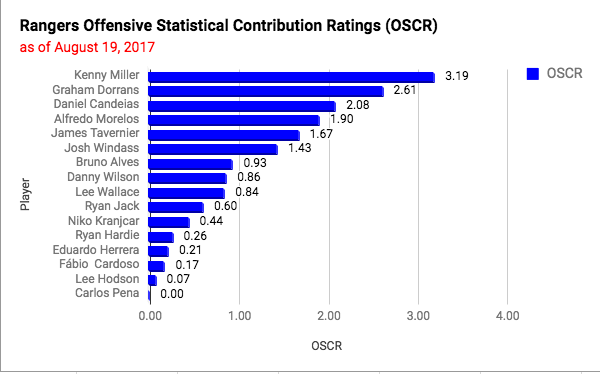 Bottom line, Miller is getting involved in plays that lead directly to shots (second on the team to Candeias with an Expected Goal Contribution of 1.56). He’s getting quality chances to score & the goals will come. The biggest issue is that you don’t want someone well past the prime of his career being your best offensive player…..which after three matches – he is for Rangers. Now for some context….here is the top 20 for OSCR for the entire Premiership. 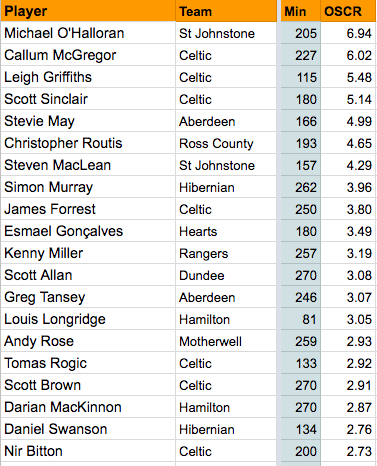 Yes…Louis Longridge has done more offensively in 81 minutes than any other Rangers player not named Kenny Miller. Again, this is league play only. Scoring for fun against Championship teams is not included & I think that it is safe to say people overreacted to Rangers recent League Cup win. Michael O’Halloran has been the best attacking player in Scotland this season. He has four goals on five shots….he’s not going to continue scoring at that kind of rate. He’s already scored 2.88 more goals than his Expected Goal output. Fortunately for St. Johnstone they also have Steven MacLean who is also off to a great start this season & has the seventh highest OSCR rating. They have what Rangers lack right now…multiple players having a real, tangible impact on the team’s attack. 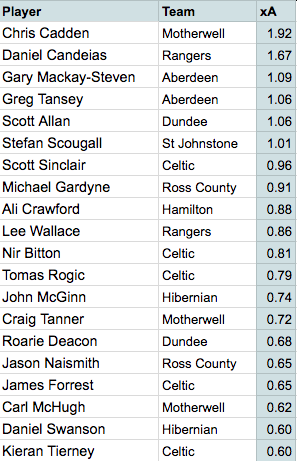 Like Miller, Scott Allan & Greg Tansey have yet to score a goal this season but are having a significant impact on their team’s chances of winning. Allan is averaging 2.33 shots per 90 minutes & 2.33 Key Passes per 90. Tansey is averaging 1.83 shots & 2.20 Key Passes per 90. It’s so early in the season that I hesitate sharing this kind of data. 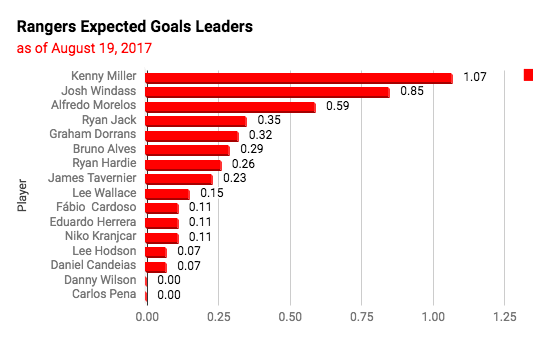 However, the question becomes besides Miller, Windass, & Morelos — where are the goals going to come from. So far, the chances are not coming from anyone else outside of isolated shots (Hardie) or a spattering of low percentage shots. After three games, only Windass, Miller, & James Tavernier have four shots or more. Alfredo Morelos has two shots in 162 minutes for an average of 1.11 shots per 90. Shots & goals don’t tend to happen without some quality passes setting up players in an advantageous position. So far, 44% of the team’s totals Expected Assists have come from Daniel Candeias. The Rangers winger is second to only Chris Cadden in the league so far & he is tied with Celtic’s James Forrest with 10 key passes this season. Rangers have 25 shots from open play after three matches & Candeias’ passing has set up 40% of those shots. Lee Wallace has never been a great crosser, but can still be effective at generating quality scoring chances – especially when he has developed consistent link up play with a supporting player (previously Barrie McKay & in the below clip, Josh Windass). Tactically, Rangers need to find ways to get players like Wallace & James Tavernier more space in the attacking area to make these kinds of plays. Additionally, Rangers desperately need to find more visionary play from the central midfield. Graham Dorrans has one Key Pass this season. He also has four Secondary Shot Assists, so he’s involved…but who is making that final defense splitting pass to generate a quality shooting opportunity? 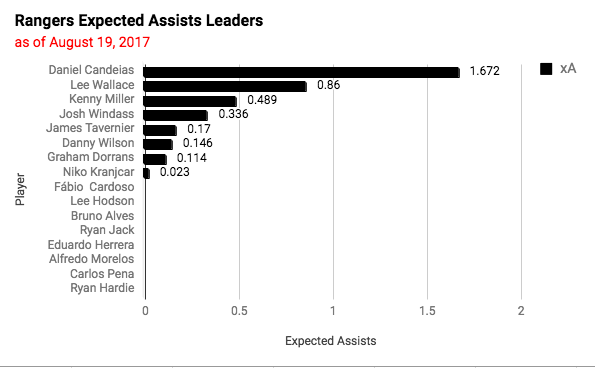 For further context, here is the top 20 players in Expected Assists from the Premiership. While players like Chris Cadden, Candeias, & Gary Mackay-Steven are generating a lot of chances from their crossing ability…what Rangers attack is lacking is the playmaking ability that players like Scott Sinclair, Scott Allan, & John McGinn are providing their clubs. Those players have combined for three actual assists – which is basically equal to their Expected Assists output. As a team, Rangers rank 6th in Scoring Chances with 11, ahead of Hamilton, Kilmarnock, Ross County (seven each), Hibs (6), Partick Thistle & Hearts (three each). 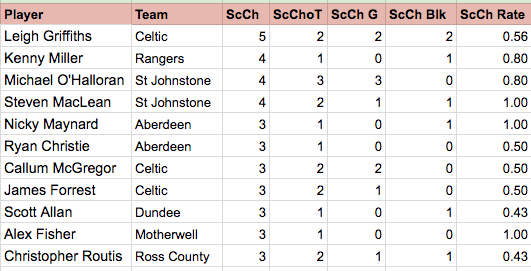 Celtic have 18 Scoring Chances, while Aberdeen have 17. Unfortunately, Rangers ability to get those Scoring Chances on target has been pretty bad. Only 27% of those 11 Scoring Chances have been on target (Motherwell has the next worst shot accuracy on Scoring Chances with 42%). 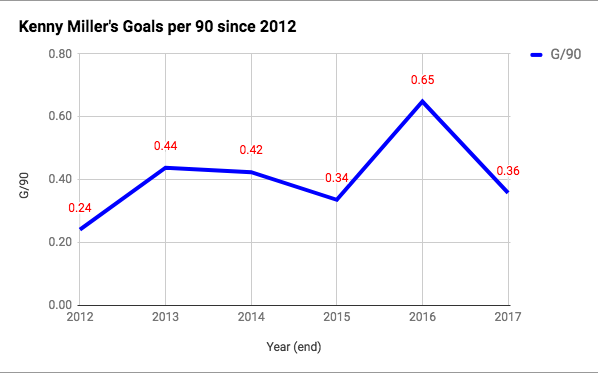 Two of the three shots on target have been goals…so if Rangers can can find ways to get more Scoring Chances…that’s the most direct route to more goals. Here is a breakdown of who is getting Rangers’ Scoring Chances, along with how many shots are on target, goals, blocked & what rate of their total shots are Scoring Chances. As the season goes on, the rate of shots that are Scoring Chances (ScCh Rate) will be an interesting tool to begin measuring the effectiveness of different strikers in the league. 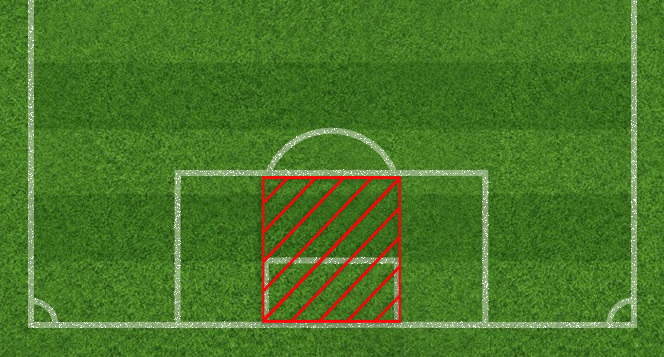 If Kenny Miller can keep seeing 80% of his shots being Scoring Chances…the goals will come. Notice that Kenny Miller isn’t the only one struggling to put away their Scoring Chances. Nicky Maynard, Ryan Christie, Scott Allan, & Alex Fisher have all been shut out & like Miller – if they keep getting those chances…well, you know what I’m going to say. I invited you to play around with all of the data that I’ve made available. These stats will be made available for FREE until September 7th. After that a one-time fee of £15 will be required to get access to the data. If circumstances change at any point & if I am unable to finish compiling the stats for the entire season than the money will be reimbursed.